With the increase in popularity of micro SIMs, being used for gadgets like iPhone 4 and iPad, cellular companies have made adjustments in their SIM designs to facilitate their customers. For an example, Ufone launched official micro SIM, which is available at all Ufone Service Centers. We have heard that Warid is working on similar idea as well. However, Telenor has responded in another way by providing a manual micro SIM cutter at all of their Sales and Service Centers. This is a cost-effective way, in fact this must has saved Telenor from plenty investment to get in-house Micro SIMs. So all the Telenor subscribers if you want a micro SIM, don’t waste your money on buying your own cutter or getting it done from a shop. You can head to any Telenor service center and get the cutting done for free. If you are not a Telenor customer, then try finding acquaintance with someone working at Telenor’s Service Centers. warid already giving away micro sim of rs.500 from its service centers only. It made me remember of the incident haha. In Japan in soap packing company they have a problem that empty packets are also going towards customers. Hahaha nice joke. Genius telenor btw. haha this is totally nuts by telenor. way to go guys… atleast u ll have some warranty on sim i.e. in the case if u r sim is not cut properly. u ll get a replacement instantly. But remember to take the separated by of the sim as u ll need it incase u want to port ur number or when u want use the SIM in another handset. What is the benefit of this micro sim? 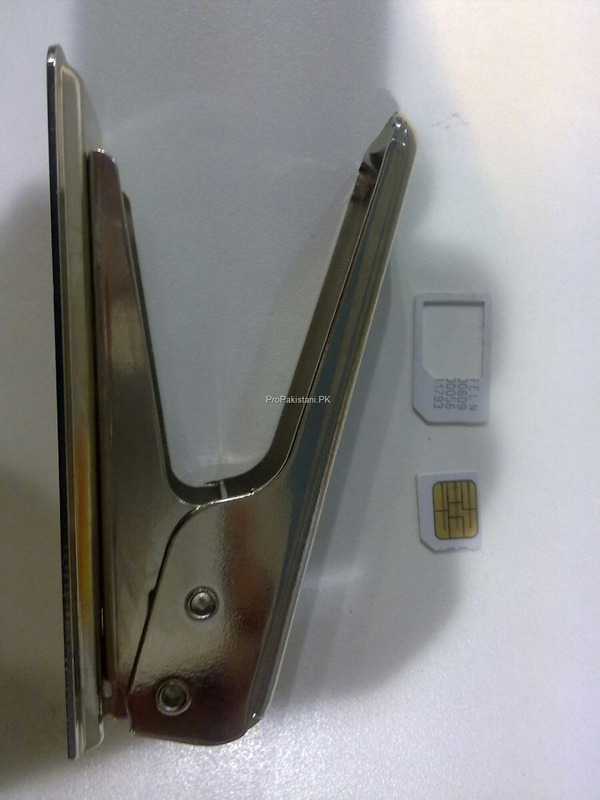 Get your own SIM cutter in 15 Euro, no need to find someone you know in telenor to get your sim card cut, keep that effort to find someone’s address etc details from his/her number. UPDATE: Just came from Telenor Business Center, Main Boulevard, Gulberg, Lahore. I had an interesting experience at the Telenor service center. The first SIM they cut for me was at a slight angle hence my phone coudldn’t read it. The same happened with another SIM which too was cut very close to the SIM circuit. Finally, I got a new SIM card issued and downloaded a sim cutter template, watched a video on youtube and cut it myself. It was free and the job was done effortlessly. Thank goodness for youtube. plz tel me the address of any telenor franchise which have sim cutter…..
plz tell me the address of any telenor franchise which have sim cutter…. today i import an iphone4 and i dnt have any idea about sim cutter & micro sim etc….